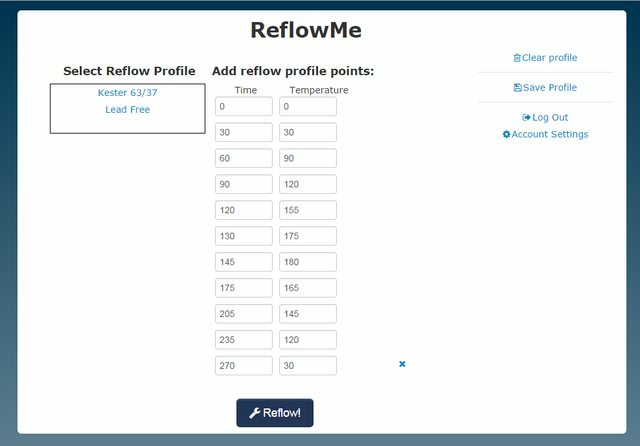 The first screen allows you to create a reflow profile, save it, or open an existing profile. 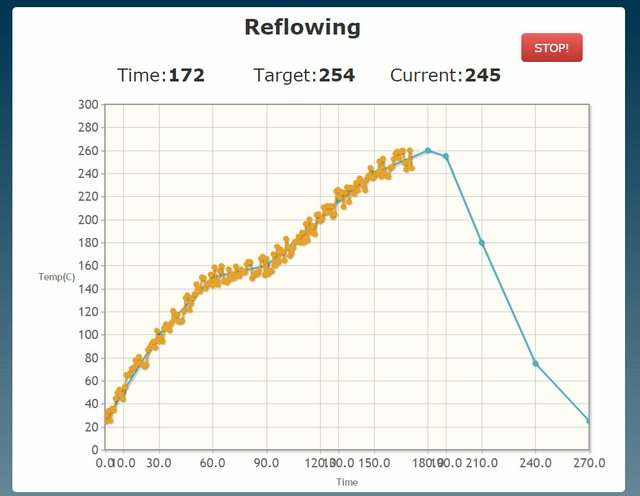 The second screen shows the reflow profile target as the blue line and then plots the actual temperature over time in orange. Right now I don't have it actually hooked up to anything, so I'm simulating the temperature reading data. There's a new, low-cost wifi chip on the market. You can now get the chip built onto a serial module board shipped from China for about $5 through aliexpress, although it takes about 3 weeks to get them in the mail. You can now get them much faster shipped from the US for about the same price . The ESP8266 module I got looks just like an HC-05 Bluetooth module and works about the same way with AT commands over serial. There's not much documentation out on it yet, but there's a community starting to develop around it. Hackaday had this article on how to remove rust using electrolysis a few weeks ago. I happened to be right in the middle of a project fixing up my old, rusty lawn mower. So, I lashed this thing together in an evening to try it out. It works pretty well! Each piece of rebar is held in place by a copper wire. The wire is run through some drilled holes around the rebar. The rebar is actually soldered to the copper wire. To solder the wire to the rebar, I first notched the rebar with an angle grinder. I then used some plumbing flux to clean the surface and a MAPP gas torch to heat it. I actually used some rosin core, leaded electronics solder to make the joint. It actually wetted pretty easily. Another wire runs all the way around the bucket. Each of the rebar wires is twisted around the main wire. I twisted a bunch of excess wire at the end of the loop to create a thick enough terminal to easily clamp onto. Software developer by day, embedded systems and electronics enthusiast by night.